Rogatchi Foundation partners with Yuvla Films, USA to create tribute to Yoram Raanan whose 40-year life's work went up in flames. In November 2016 over 2000 paintings and 40 years of work were destroyed by fire in Moshav Beit Meir. 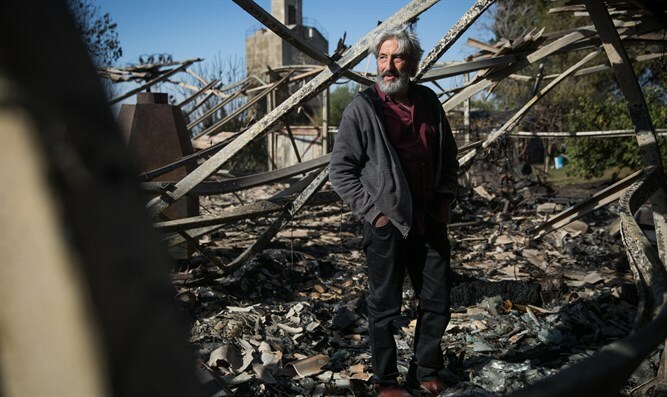 World-renowned artist Yoram Raanan lost his studio in that fire, and today other artists and admirers have joined together a campaign on Raanan's behalf. Dr. Inna and Michael Rogatchi of the Rogatchi Foundation have begun a partnering campaign together with Yuvla Films, USA to fund the final stage of a 30-minute film about the great artist whose entire life's work was destroyed by the sudden fire. The film is about Yoram and his family and how they survived such devastation, and is in final production stages. Director Bentzi Avtzon is running a crowd-funding campaign to collect the funds needed to finish the film. "We were and still are absolutely shocked by the tragedy of Raanans when 40 years of Yoram's work, and all their books and professional records were destroyed in that awful fire," said Inna Rogatchi. "And we admire Yoram's strength and serenity in the aftermath, and his extremely successful work in his new, very productive post-fire period. "Yoram is not only a really great artist of our time. He is also an unique personality who was not devastated by that unimaginable loss, but continued to work and produce beautiful pieces of uplifting art. "He is also a very nice person who has wonderful family - his wife Meira, their four children and grandchildren. Rarely one can meet such good, talented, and harmonious people," Rogatchi added. She went on to explain who is producing the film and how it is being accomplished: "Young American film-maker Bentzi Avtzon produces soulful and elegant documentaries enchanted with beautiful music. He took the Yoram's story close to heart (as did we at the time), and flew from Philadelphia to Israel to make the film. "In the trailer you would see the superb cinematography, and what a soulful and truly special film it promises to be. "Now Bentzi and his Yuvla Films are on the final stage of the production, and they are running crow​d-funding campaign for finishing the film and its release this coming November. "As friends and colleagues of Yoram Raanan and his family and as supporters of Bentzi Avtzon in making this important documentary on unbeatable quality of human spirit, we appeal to you, our dear friends, with the proposal to support the film and to help to make it happen," Rogatchi wrote.